Irish company, ALISON, a free online learning website, has seen its numbers of registered learners worldwide reach 500,000. 40,000 of these are Irish people. Providing over 150 high quality interactive multimedia certified courses in a diverse range of subjects, the number of ALISON learners is set to grow exponentially over the next year, as more people are looking to up skill themselves in order to avail of opportunities that arise. ALISON provides interactive multimedia courses for subjects as diverse as IT Literacy, English Language, Financial Literacy, Math, Business Skills and Health & Safety for Schools. It serves both the adult and second level learners. All these courses are available for free, and are interactive; they contain audio, video, Adobe Flash, online quizzes, assessments and SCORM compliant content. After successfully completing these courses, you will be able to download your Certificate of Completion. Since the beginning of 2007, ALISON has acquired learners in every country worldwide. It's mission is to enable anyone, anywhere to educate themselves for free via the Internet. An example of an ALISON course is ABC IT, which is the most popular IT skills certification. It includes comprehensive training on the Internet, key desktop applications like Word and Excel as well as the full range of practical IT skills, including touch-typing and the efficient use of Web-based e-mail. It is also prefaced by a beginner's guide to a personal computer, and so is ideal for learners who have no IT experience. For Certification, ALISON uses a highly innovative approach of Flash-Testing, where anyone, anywhere, can be challenged to take a five minute test to validate their certification attainment via ALISON. In this way, both training and testing are provided free of charge. ALISON provides FREE online learning via interactive multimedia for basic and essential workplace and life skills. It has registered learners in every country worldwide covering subjects such as IT Skills, Health and Safety, English Language, Psychometric tests, Financial Literacy, Financial and Health Literacy. Corporate, Human Resource, Operations, Project and Information Technology Management, Accounting, Psychology, Biology, Economics, Government Policy, English Grammar, English Literature, English Writing, General Science, Biology, Chemistry, Physics, Human Health, Mathematics, Law, Outdoor Education, Coaching, Training Theory, Adventure, Visual Communication and Design. ALISON also provides free learner group management for trainers, teachers, tutors and HR Manager's in schools, colleges and universities. ALISON is a privately-owned social enterprise headquartered in Galway, Ireland and promoted with the assistance of over 3,000 volunteers worldwide. The mission of ALISON is to enable, anyone, anywhere, to educate themselves for free via interactive multimedia on any subject online. ALISON stands for Advance Learning Interactive Systems Online. Ken Martin has been in touch to reminds us about the following 10 Things the Class of 2014 Hasn’t Experienced. Every once in a while, it hits you – "Man, I’m old." Many of us are having the same experience as we realize the incoming class of college freshmen was born in 1991 and 1992, when Clinton was in the process of becoming the 42nd president, the first Iraq War was a resounding success and you were slow jamming to Boyz II Men. Today, we have our first African American president, we’re mired in a now seven-and-a-half year war in Iraq, and Lady Gaga is making us forget about Madonna. Other aspects of our lives have changed as well, making our day-to-day activities easier to accomplish. Below is a list of the 10 things the class of 2014 hasn’t experienced, or more accurately, the 10 things a majority of 18-year-olds haven’t experienced firsthand. UCF online-learning experts have been called upon to speak at conferences and share expertise with other colleges and universities across the country, said Joel Hartman, vice provost for information technologies and resources. Through the years, Hartman has guided the expansion of a comprehensive course-development system that includes intensive training for instructors and constant research into new technology. The goal is to make the online class experience as engaging and rigorous as any face-to-face class. Taking courses online requires students “to stay focused and manage your time well,” student Kyle Hickman said. As students descend on the University of Central Florida’s main campus this week for a new academic year, a growing form of traffic is set to rival the school’s notorious morning rush to find a parking space. Online traffic is burgeoning as UCF students take more courses by computer. Checking into class online from a dorm room or an off-campus home, coffee shop or even poolside could help ease the traffic tie-ups and classroom crowding fueled by UCF’s record enrollment growth, officials say. Surveys show students like the quality of their instruction in addition to the flexibility that going online adds to their schedules, UCF officials say. Don't miss this article below. Professor Emeritus of the University of Calgary, George Lane writes in The Calgary Herald, "I was surprised and dismayed at the results of the Herald's VoxPop poll on August 21 that showed 56 per cent of respondents disapprove of students using laptops in school." In recent years most kindergarten-to-Grade-12 school systems have made great strides in getting technology into the classroom. The next logical pedagogy advanced by educational leaders is personalization of learning -- a paradigm that is, in part, facilitated by the use of personal computing devices such as the laptop, iPad and other wireless devices. 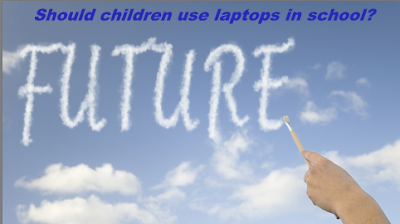 However not all parents can afford to buy each of their children a laptop and most school districts can't afford to provide them. Is there a solution to this dilemma? Could it be solved if school systems moved from a practice of technology in the classroom to technology as the classroom? 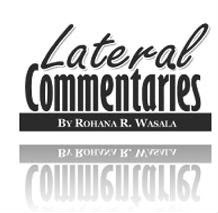 Sri Lanka has made considerable progress in the field of distance education over the past three decades. Opportunities for Sri Lankan students to access both national and international educational organizations through technology are increasing. This will make a remarkable contribution to efforts directed at promoting equality of opportunity for all citizens across the chronic urban-rural divide. The term ‘distance learning’, as used in Sri Lanka, until very recently has referred to two modes of education where the teacher and the students are separated by time and space at least for part of the duration of a course: at the very beginning, it meant a course of study totally delivered through correspondence; in more recent times, we have begun to see that distance learning implies a mix of paper-based face-to-face instruction supplemented by self-access work by the students as in the case of the current Open University of Sri Lanka distance education courses. However, today, with more and more modern technology being integrated into education, distance learning is assuming a very different identity. Mark J. W. Lee has sent me an introducing to the newly released book below. 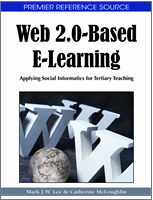 This book is a terrific inspirational reading for anyone looking to Web 2.0-Based eLearning. Educational communities today are rapidly increasing their interest in Web 2.0 and e-learning advancements for the enhancement of teaching practices. Web 2.0-Based E-Learning: Applying Social Informatics for Tertiary Teaching provides a useful and valuable reference to the latest advances in the area of educational technology and e-learning. This innovative book offers an excellent resource for any practitioner, researcher, or academician with an interest in the use of the Web for providing meaningful learning experiences. For more information about Web 2.0-Based E-Learning: Applying Social Informatics for Tertiary Teaching, and to view the Table of Contents, go to http://igi-global.com/Bookstore/TitleDetails.aspx?TitleId=40272 . On this site you will also be able to read the full text of the Preface of the book, which provides an introduction and thematic overview of the various chapters. You can also download the first chapter of the publication for free from the site. 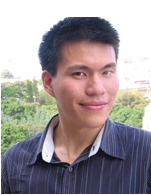 Mark J. W. Lee is an Adjunct Senior Lecturer with the School of Education at Charles SturtUniversity. He concurrently holds Adjunct Senior Lecturer and Honorary Research Fellow appointments with the Distance Education Hub (DE Hub) research institute at the University ofNew England and the Graduate School of Information Technology and Mathematical Sciences at the University of Ballarat, respectively. Previously, he worked in a variety of teaching, instructional design, and managerial roles within the private vocational education and higher education sectors. Mark has published extensively in the areas of educational technology, e-learning, and innovative pedagogy in tertiary education, with over 50 refereed publications to his name. He is the immediate past Chair of the New South Wales Chapter of the Institute of Electrical and Electronics Engineers (IEEE) Education Society, a former director of the International Board of Standards for Training, Performance and Instruction (ibstpi), and a former executive committee member of the Open and Learning Distance Association of Australasia (ODLAA). Presently, he serves as Editor-in-Chief of Impact: Journal of Applied Research in Workplace E-learning, in addition to being on the editorial boards of several other highly reputable international journals. He is a Senior Member of the IEEE, Australian Computer Society (ACS), and Association for Computing Machinery (ACM), and an Associate Fellow of the Australian Institute of Management (AIM). 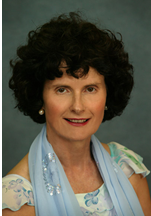 Catherine McLoughlin is an Associate Professor with the School of Education at the AustralianCatholic University, Canberra, where she formerly served as Head of School. She also is the coordinator of the Australian Capital Territory branch of the Research Centre for Science, Information Technology and Mathematics Education for Rural and Regional Australia (SiMERR). With over 20 years’ experience in higher education in Europe, Southeast Asia, the Middle East, and Australia, Catherine has experience and expertise in a variety of educational settings, with diverse students and across a wide range of cultural contexts. She is a member of the Executive Committee of the Australasian Society for Computers in Learning in Tertiary Education (ASCILITE), with oversight for the Society’s research strategies and initiatives, and Editor of ASCILITE’s official journal, the Australasian Journal of Educational Technology. Last but not least, Catherine is an editorial board member of a number of leading journals, including the British Journal of Educational Technology. The editors can be contacted via email at web2.0ishere@gmail.com . Today I have Brian Jenkins guest blogging. Please be sure to check out his unique guest post. Guest posts are always welcome, please contact me. There are numerous webinars, workshops, seminars, videos and websites designed to transform technologically challenged teachers into tech-savvy educators. It can be confusing to decide where to start. An alternative approach is to combine some of this e-learning with a technology coach! A technology coach provides plenty of personalized attention that you won't get in formal computer classes or webinars. Due to the numerous networking sites designed for educators you can easily find an online technology coach. Place a request at a forum or have a friend help you send out a tweet. Teachers help others so your technology coach request will probably produce a positive result. You may get numerous offers. Before the training begins, be prepared by making a list of the technological skills you already have and a prioritized list of the skills you want to acquire. Also, have a list of pertinent questions. Do some advanced homework by visiting some of the technology/education websites. This will make it easier for you and your coach. Be active in your technology training. Make sure there is an ample amount of hands-on training and not just lectures via instant messaging or Skype. You can learn a lot from personalized mini-lessons. Don't be afraid to keep asking questions until you fully understand the answers. You're dealing with a teacher, so he or she won't be stunned if you don't catch on the first time. Also, ask your tech savvy coach exactly how he or she uses technology to enhance education. You'll probably get some great tips. If things go wrong in your school classroom it's great to have a mentor who can listen to your troubles and offer advice and more training. You'll have the opportunity to discuss the details of your situation which you wouldn't have by attending a seminar. After you become a tech savvy teacher, you might be able to volunteer to be a technology coach yourself! Brian Jenkins writes about Careers in Education for Braintrack.com. Many thanks to Brian Jenkins. "Cyber bullying can take many forms—sending hurtful text messages and pictures, posting cruel comments online, or creating fake Facebook or MySpace pages to impersonate other kids, for example—and it can have a devastating effect, especially considering the amount of time kids today spend online, texting, and using digital media." "While cyber bullying might start from home, it can quickly move to the school environment—and yet many schools may not be prepared to address it. 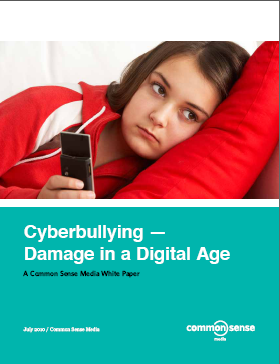 This timely white paper from Common Sense Media is designed to help parents, educators, policy makers, and the online industry explore proactive steps to prevent cyber bullying, such as through digital literacy and citizenship education programs." report eSchool News. As it becomes more common, teachers work to make it as engaging as traditional classroom instruction. Let’s face it: Online education is here to stay. But re-creating the experience of a traditional classroom in a virtual environment is a tricky feat. “You come up with all these things as a teacher, like whether you’re going to tell a joke at the five-minute mark, or whether you’re going to ask a certain student something. 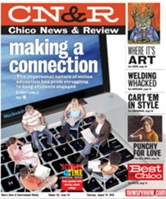 I don’t know if you can put that into an online environment,” said Scott Brady, a Chico State geography professor who has taught at least one online class each semester for nine years. 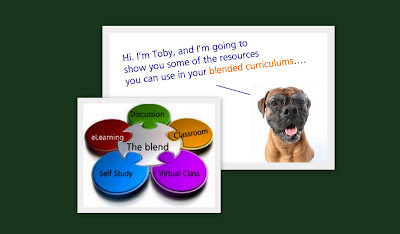 Have you ever wondered what the term "blended learning" really means? Is it that different from what we've always done? Experts say it creates a better, more sustained, learning outcome, but why? If you're curious take this free 30 minute eLearning course on Blended Learning below. The Training Doctor, LLC, an instructional design firm with over 20 years of experience designing customized training programs for Fortune 500 companies, provides a free 30-minute downloadable eLearning primer on blended learning from its website. The primer discusses not only the various learning elements of a blended design, but also the importance of document and graphic design to achieving learning outcomes. Presented in a humorous way, with a "brainiac dog" as your guide, the eLearning module can be downloaded and revisited again and again. Are our children getting better education outcomes by using online technologies? 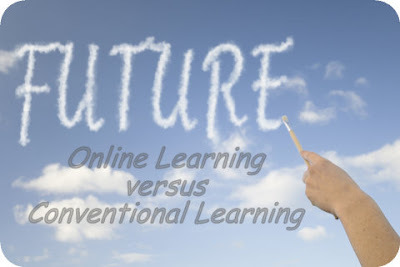 As a parent of school aged children I have reoccurring conversations with my partner about whether online learning gives our children positive learning outcomes relative to learning from conventional methods. More over, are our children being disadvantaged by the distraction of learning from digital or online technologies? In research provided by University of Technology Vienna, “Hypermedia in Education - Monitoring the Development of Hypermedia Documents” naïve internet users found reading online difficult due to the disruptive nature of clicking on too many hypertext links. Studies in 1989 and 1990 showed readers navigated aimlessly around text that was peppered with hypertext links and could not remember what they had and had not previously read. To help potential students looking to earn an online college degree, MyCollegesAndCareer.com has 10 online colleges that are worth looking into. MyCollegesandCareers.com helps students connect with the best schools available to earn their college degree and embark on a rewarding career! A powerful resource for individuals who have full-time jobs or family responsibilities, My Colleges and Careers connects people with the programs that help them to earn their degree online. The renowned Leiden Ranking over the 100 largest European universities places the Technical University of Denmark seventh. Leiden Ranking 2010 includes the 100 and 250 largest European universities respectively based on citation data in Web of Science indexed publications during the period 2004-2008. The university rankings are based on the so-called Crown Indicator, which has been developed by researchers at the University of Leiden in the Netherlands. The indicator makes it possible to compare research at large and small universities within various research fields and it is internationally recognised as the best indicator available at present. To help spur interest in science, technology, engineering, and mathematics, many schools have begun to integrate robotics into the curriculum—but are younger students and their teachers ready for a new wave of robotic teaching assistants? Many researchers and robotics experts agree that robot teachers are no longer the stuff of science fiction—they’re part of a new workforce designed to lend a helping hand to classroom teachers … whose jobs aren’t in jeopardy any time soon, experts say. Although the technology is still in its developmental stage, and Apple has yet to develop an iRobot, assistant teaching robots already are being piloted in classrooms from Korea to San Diego, Calif. The benefits, say researchers, are that robots not only provide infinite patience but can handle simple tasks that take up teachers’ valuable classroom time. Today I have Kate Cunningham guest blogging. Please be sure to check out her unique guest post. Guest posts are always welcome, please contact me. We all know the wonderful advantages that those who decide to take up eLearning can accrue. Whether you are enrolled in a full online degree program, you're taking advantage of some open courses that a few brick-and-mortar universities offer, or you're just surfing around, teaching yourself with the various online eLearning tools that are available throughout cyberspace, you're always connected. And being always connected means you'll inevitably encounter distractions. Here are a few ways to avoid such Net time killers like Facebook, Twitter, StumbleUpon, or even Wikipedia. 1. Keep your study area and your surfing around areas separate. The mind tends to associate certain places with specific tasks. So if you both work and play in the same place, it will be difficult to keep the two separate. If you have a desk or other work station, tell yourself you will only study in those areas. Your free Net surfing time can be done on the couch or in bed or another area where you engage in recreational activities. 2. Look up some self-motivating tools that block time-frittering sites. 3. Turn off chat sites while you study. While it can be helpful and sometimes necessary to communicate via instant message sites with a fellow student or another friend who can help you with precisely what you are studying, remember to only stick to the necessary conversations. If you don't need to talk to anyone, then don't do it. You can create separate lists of study buddies and family/friends, and sign in only to the appropriate list at the appropriate time. Study breaks are absolutely instrumental to any learning endeavor, so don't kick yourself if you need a breather before returning back to the computer. The only time that breaks become an out-of-control phenomenon is when you let them. Monitor each break and make sure you don't go over the time limit. Also, be sure to really take a break when you take a break. In other words, if you spend your break time fretting about how much you have to get accomplished once you return to work, then you might as well have not taken a break at all. Free time is strictly for relaxing. You'll come back to the computer with a renewed sense of purpose and drive. These are just a few ways to maximize your time spent eLearning. Other options that enhance productivity can work just as well--like listening to certain kinds of music--if they work specifically for you. This guest post is contributed by Kate Cunningham, who writes on the topics of online university rankings. She welcomes your questions and comments at her email Id: cn.kate1@gmail.com. Many thanks to Kate Cunningham.